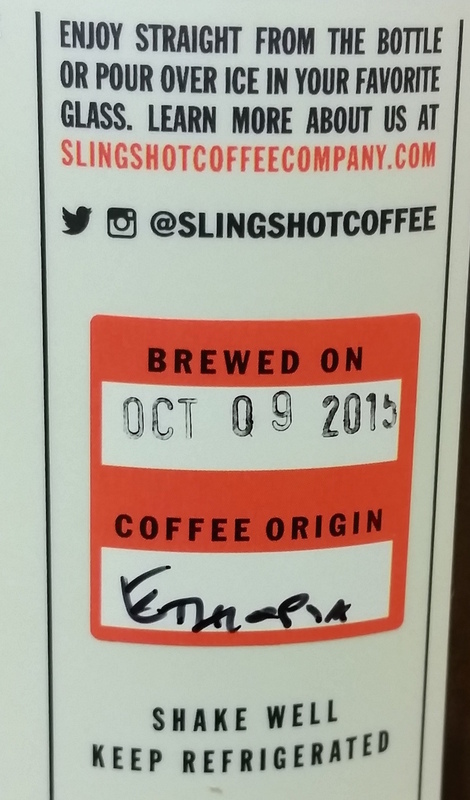 Recently we received a package from the good folks at Slingshot Coffee Co in Raleigh, North Carolina with some goodies. Jonathan and Jenny Bonchak started this company in 2012, and they have been making bottled cold brew and cascara tea to tantalize your taste buds. While their main distribution started in the state of North Carolina, their reach is now from Massachusetts to Florida. Not on the east coast? They do offer shipping of their products direct to your door. They are brewing their coffee fresh and shipping 2-day in order to ensure the coffee is as fresh as possible. The price for mail order is a little expensive, but if you are really into the cold brew movement I think you will be pleased with the quality of their products. 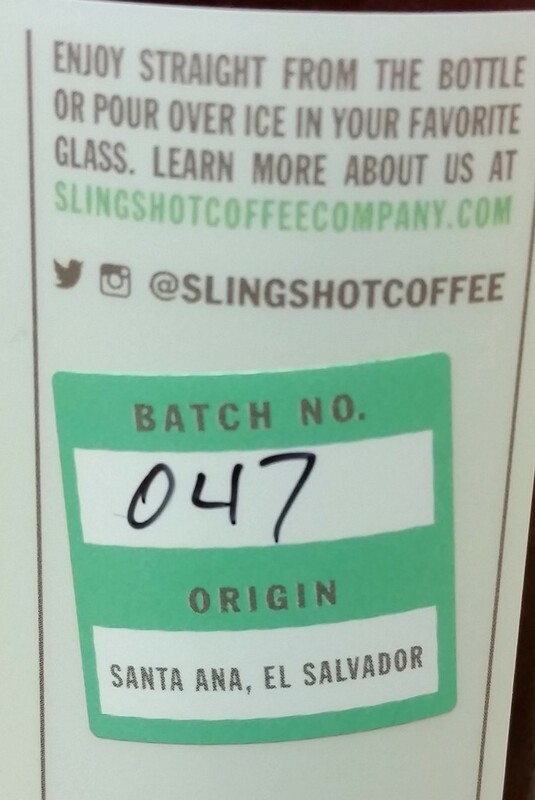 If you live in the southern region of the U.S., you should be able to find the bottle in a local Whole Foods or other retailer, and I definitely recommend you try Slingshot over many other ready to drink bottled coffee out there. The cold brew we were sent was an Ethiopian origin, and the Cascara tea (tea made from the dried fruit of the coffee cherry) comes from well known coffee producer Aida Batlle‘s farm in El Salvador. Clearly we tasted them both, so here is our review! Right off the bat, the simplicity of chocolate touches the senses. We poured it cold, straight from the bottle with no ice. I was citrusy and crisp, at times reminding of a tangy red apple. Sweetness was low-toned with hints of chocolate. It was smooth, drinkable, tea-like, with some reminiscence of dried fruits. After the coffee sat for a couple minutes it opened up in flavor, much like a wine does. As it opened up, more plum and stone fruit notes became apparent along with an almost perfume-like floral component. Overall we can say this is one of the most refreshing and drinkable cold brew bottles we have ever tried. As it was “ready to drink” it is important to note that the strength of the brew was just right. Not too strong, nor weak. If you want to know why all the coffee geeks are getting excited about cold brew, this is a solid example. If you have never had cascara tea before, you are in for a unique experience. Opening the bottle the aroma of sweet apple juice was dominant. Again we poured it straight from the bottle with no ice, since it was already quite cold. The flavor was not as sweet as the aroma, so don’t take a gulp expecting to taste juice. Instead, the flavors of dried cherries, raisins, and citrus peel were dominant. A tart and tangy berry note zipped on the tongue, but was quickly subdued by a sweet and smooth finish. One outstanding element of this tea was the mouth-feel. It was incredibly smooth, almost silk-like on the tongue. The combination of flavors and body led to a clean and soothing experience. Again it seems that Slingshot has perfected their brewing strength, as this tea never came across as watery or dense. Possibly the best straight cascara tea we have tasted. 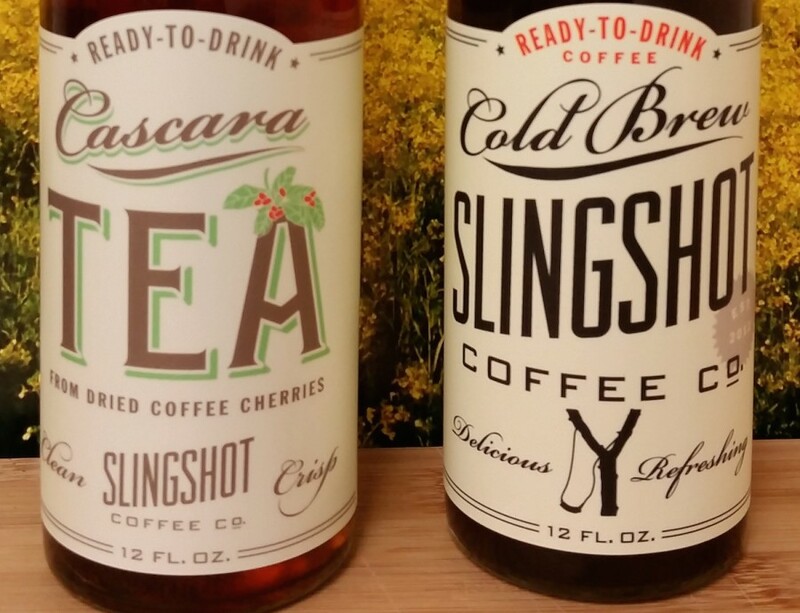 After tasting these two offerings from the Slingshot Coffee company, we think they are onto something. Ready-to-drink coffee is a trend that seems to keep growing, and it is wonderful to see new companies pushing the limits of coffee flavor in a prepared beverage. We are excited to see what they do next!